We’d love your help. Let us know what’s wrong with this preview of The Entropy Effect by Vonda N. McIntyre. To ask other readers questions about The Entropy Effect, please sign up. 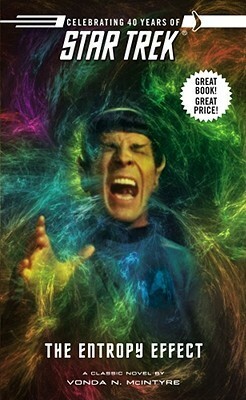 Why is the cover just Spock mind-melding with the Horta?! what a fun book! time travel, singularities, convoluted plots, intrigue... not to mention mcintyre's original character, mandala flynn, who is an absolute treasure. can i get a book series about her? and all the other wonderful ladies mcintyre made up for this book? Considering it's a Star Trek novel, Entropy Effect is by no means a bad book. I can't, in good conscience call it a particularly good book. It was like an oatmeal cookie. A quick snack. I probably would have preferred chocolate chip, but I was all out and, besides, I knew what I was getting when I reached for the oatmeal cookie and - I'm just making myself hungry at this point, so I'm going to drop the analogy. Bottom line: It's short and decent, but I've read superior fanfiction online and for f Considering it's a Star Trek novel, Entropy Effect is by no means a bad book. I can't, in good conscience call it a particularly good book. It was like an oatmeal cookie. A quick snack. I probably would have preferred chocolate chip, but I was all out and, besides, I knew what I was getting when I reached for the oatmeal cookie and - I'm just making myself hungry at this point, so I'm going to drop the analogy. Started a bit slowly but really picked up by the end. This review has been hidden because it contains spoilers. To view it, click here. I finished this one because it's so short- I might not have had the patience to slog through a longer version of this book. What we have here is a time-travel-paradox book. We the readers pretty much know this going in because of the book blurb. What you'll need to know: Vonda McIntye apparently really, really likes Sulu. If you look up older versions of this book you'll see a rather silly picture of him with long hair and a droopy mustache, which seems to be her version of an ideal Sulu. He gets I finished this one because it's so short- I might not have had the patience to slog through a longer version of this book. What you'll need to know: Vonda McIntye apparently really, really likes Sulu. If you look up older versions of this book you'll see a rather silly picture of him with long hair and a droopy mustache, which seems to be her version of an ideal Sulu. He gets a romantic partner in this book. However, McIntyre's Sulu seems to have a lot of self-doubt and his storyline really doesn't involve what's happening in the rest of the book except obliquely. Spock is the other main character in this book. He ends up needing to set straight a timeline gone awry. It's one of those what-if books. What if Kirk gets killed- how will Spock save him and restore the rightful timeline? I used to eat these tie-in books up when I was younger. I loved reading new adventures about my favorite characters. As I've gotten older, though, I'm starting to notice that the authors writing these books sometimes have really different ideas about characters than I do. Sulu's mustache, for example. In this book, Scotty's kind of a jealous jerk. McCoy is kind of abrasive, too. This stuff bothers me now because I'm less able to just accept what an author throws at me than I used to be. For a time travel book, this took an awfully long time to get to the actual time travel. The future version of the person Spock must stop decided to send his "friends" back into the past pretty much because these friends thought it would be cool, as far as I can tell. When I read this motivation for time travel initially, I thought it must be the explanation of someone who's deluded and that these friends were really master manipulators. Well, no. By the end of the book we find that it's really just a bunch of people who thought it would be cool to travel back in time, without any thought for how that might affect the time-space continuum. Lamest reason for a Star Trek time travel caper ever. A little break from all these picture books seems to be in order, so let's go with something completely different: The Entropy Effect by Vonda N. McIntyre, which is #2 in the Pocket Books line of Star Trek novels. The Enterprise has been in orbit of a singularity for six weeks, Mr. Spock making careful observations of this unusual phenomenon, when they are called away to Aleph Prime by an ultimate override command--to be used only in the most dire of situations. They arrive to find no great eme A little break from all these picture books seems to be in order, so let's go with something completely different: The Entropy Effect by Vonda N. McIntyre, which is #2 in the Pocket Books line of Star Trek novels. They arrive to find no great emergency at all. Instead, they're asked to transport a criminal a short distance to a rehabilitation facility. Captain Kirk would have angrily refused, but Spock asks him to accede to this request. It seems that the criminal in question is a scientist of Spock's acquaintance, and there's something fishy about the situation. Spock's investigation uncovers a threat to the entire universe, which he must handle covertly, if he can. The Entropy Effect focuses on a few characters only: Spock, McCoy, Kirk, and Sulu, plus Mandala Flynn and Hunter, characters original to the novel. The bulk of the novel follows Spock as he deals with the situation, but it takes time to give us some insight into the others, as well. Importantly, in Trek history, it is in this novel that Sulu is given his name, Hikaru (which wouldn't be officially confirmed until a decade later, in The Undiscovered Country), and promised a promotion to lieutenant commander. The original characters are the high point of the novel. Flynn and the security officers under her command are each interesting: Flynn's desire to prove herself is admirable; Jenniver's difficulties fitting in inspire sympathy; Neon's unusual language (consisting only of nouns) and Snnanagfashtalli's loyalty to Jenniver each merit a mention, as well. Hunter, Kirk's past love, is of little import to the plot, but she does add some needed variety. She has a child, and is part of a nontraditional family arrangement--it's good to show that humans, too, are diverse. There are as many ways to live as there are people on the Earth, and space travel doesn't do anything to simplify that. Is it odd that each of the characters I identified as being of particular interest is female? Early Trek is certainly a story of men, and this novel, for all its focus on Spock, does somewhat counterbalance that. The Entropy Effect's plot eventually revolves around time travel, and it's handled fairly well, in a Star Trek sort of way. It's shown to be difficult and far from consequence-free, and there's a bit of suspense as we wonder how (though--let's be honest--not if) Spock will manage his task. For a tiny little book it sure packs a heck of wallop! It's a little slow to get going but once it hits its stride (by that I mean the events described in the summary come into play) it is ridiculous and very close to being nail biting. Everything is weird from the word go. Spock and Kirk are weird with each other - I don't know where in the chronology this novel fits but I'm betting early days since both of them aren't quite as Best Friends Forever-y as they end up being yet - but it's not just For a tiny little book it sure packs a heck of wallop! It's a little slow to get going but once it hits its stride (by that I mean the events described in the summary come into play) it is ridiculous and very close to being nail biting. Everything is weird from the word go. Spock and Kirk are weird with each other - I don't know where in the chronology this novel fits but I'm betting early days since both of them aren't quite as Best Friends Forever-y as they end up being yet - but it's not just them. We have Sulu hunting for a transfer (and growing a moustache and longer hair), Scott being incredibly irritable and feeling like he's being shut out. It's all just a mess and everything and everyone just feels weird. If this was a conscious decision it was very well played. Things get a little bit Benny Hill once the main, wonderfully written and heartwrenching, tragedy takes place. Spock is leaping through time like crazy and meanwhile McCoy (McCoy! Scott meanwhile is extremely confused and hurt and justifiably so) has to command everything and cover Spock ('he's not prostrate with grief, he's sleeping') Holy cats! It's a whirlwind I tell you. In that whirlwind we get the treats that are Security Chief Mandela Flynn (and her romance with Sulu, but on her own she is awesome and I love her), several non human security team members (all awesome and I love the thought that went into them. Neon especially, brief as she appeared. Not to say Snarl and Jenniver are also not badass because they are). And Captain Hunter of the boarder patrol, once again she's presented as an ex-fling of Kirk's but she also comes from a different background (culture and family and I'm not spoiling her family arrangements for you but she's aboriginal which is cool and there's a lovely bit where she flashes back to defending her right to wear a feather in her hair and it is awesome). There are lot of fierce ladies in this book. Original characters mostly (poor Uhura and Chapel get a bit of the shaft but when we do see them they are lovely). Read the whole thing in one day sitting by the water. Whenever I put it down to get some Diet Coke or take a bathroom break, I spent the whole time wondering what would happen next. That's my idea of perfect vacation reading. When it was originally published in the summer of 1981 Vonda McIntyre's book represented something of a new frontier (if you'll forgive my use of the phrase) in the Star Trek franchise. Though the second entry in Pocket Books's series of Star Trek novels, it was the first original story they published (the first book was the novelization of Star Trek: The Motion Picture ). As such, it represented an effort to develop the franchise, rather than the more half-hearted adaptations of the Bantam Boo When it was originally published in the summer of 1981 Vonda McIntyre's book represented something of a new frontier (if you'll forgive my use of the phrase) in the Star Trek franchise. Though the second entry in Pocket Books's series of Star Trek novels, it was the first original story they published (the first book was the novelization of Star Trek: The Motion Picture ). As such, it represented an effort to develop the franchise, rather than the more half-hearted adaptations of the Bantam Books series in the 1970s. If the series's editors wanted to use the first original novel to set expectations, it is difficult to imagine choosing a better book than this one. McIntyre's novel opens by setting the stakes, as while studying a naked singularity that suddenly appeared in a warp lane, Spock discovers that the universe has only a century remaining before its demise. Before he can verify his data, the Enterprise is summoned to a nearby planet to transport a dangerous prisoner for rehabilitation. The prisoner turns out to be Spock's old physics instructor, Georges Mordreaux, who was convicted of murder after the disappearance of several people, all of whom Mordreaux claims had been sent back into the past. Though skeptical of Mordreaux's claims, Spock investigates Mordreauxs claim after the physicist suddenly appears on the bridge and kills Captain Kirk — all while supposedly detained in a guarded and shielded room on the ship. I wasn’t really excited about one more StarTrek the me travel story and about 2/3rds through, it seemed like it was going to be the same as most time travel stories. The end, however, is a bit unique. I will admit that I enjoyed this old TOS based story. This was an absolutely epic novel of the Star Trek franchise. As a Spock fan (as too many of us to count are), this is a perfect novel to make my heart sing. I am also a fan of temporal science fiction, so as Spock fights the entropy effect to restore temporal stability in the universe, I hung on every word. An excellent novel, interesting story, and chalk full of Spock, what more could you want? Easily the second-best ST novel ever written. Even though I have not read a Star Trek novel in forever, I remember Vonda McIntyre as being a writer who made that universe believable. This is a book that I read quite some time ago and I’d remembered thoroughly enjoying it. Would it still have the magic? Oh, yes. Vonda McIntyre was my favorite “Star Trek Universe” writer. Her characters grew beautifully from the series, spreading out in ways that we as viewers hadn’t seen before, but that didn’t betray what we already knew about them. There was also a comfortable expansion of science so that it felt futuristic. I learned quite a bit about “entropy.” It was a new adventure of a This is a book that I read quite some time ago and I’d remembered thoroughly enjoying it. Would it still have the magic? Oh, yes. Vonda McIntyre was my favorite “Star Trek Universe” writer. Her characters grew beautifully from the series, spreading out in ways that we as viewers hadn’t seen before, but that didn’t betray what we already knew about them. There was also a comfortable expansion of science so that it felt futuristic. I learned quite a bit about “entropy.” It was a new adventure of a beloved series in every way. This book opens up more of Mr. Sulu’s backstory ... and gives us yet another “past love affair” for James Kirk. The stakes are incredibly high in this time travel story. Readers of science fiction and science fantasy have long been warned of the paradoxes that can occur. That is part of this one, too, but it is not the main threat. The consequences here are much more dire. Mr. Spock was always the most fascinating character in the original series, and the writer fleshes out new discoveries about him while still staying within the Star Trek mythos. The decisions he needs to make are intriguing and the toll is heavy. My favorite part is that the events do change the characters, and those changes fit with how the characters developed in the series and the movies. Often, writers often return main Star Trek characters to a “reset” point, certainly to assure that nothing we’ve read will contradict what we saw in the series. While assuring consistency, it would leave me feeling that I shouldn’t have bothered to read the story at all. That was not the case here. When I read a Star Trek novel, I weigh it not in terms of other fiction but as a new episode of Star Trek. The Entropy Effect was the first Trek novel published after the novelization of Star Trek: The Motion Picture. Although the original cover had the uniforms from the first Trek movie, the novel is obviously set during the Enterprise’s five-year mission. 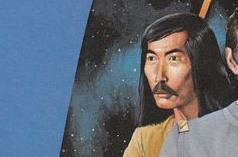 For some odd reason a note is made that Sulu is growing a moustache and long hair. I guess so that he has that cool 1970’s look. The story doe When I read a Star Trek novel, I weigh it not in terms of other fiction but as a new episode of Star Trek. The plot deals with a singularity that the Enterprise is studying before it is called to an outpost to transport a prisoner who has been convicted of murder. The mystery deepens when the crew discovers that something has been removed from the official records and the prisoner, Georges Mordreaux is a brilliant physicist who was one of Spock’s former teachers. The plot itself deals with time travel and multiple timelines that are connected to the singularity, as well as the now dreaded “reset” button. When this novel was published in 1981, time travel had only been seen a handful of times in the original series and we had never seen a reset button Trek episode. In this context, I am sure the plot was thoughtful and original at the time and served to flesh out the characters while restoring the status quo by the end of the story. What is appealing about this novel is McIntyre’s original contributions. She introduces several original characters and some intriguing concepts to the Trek universe that probably would have been too progressive for TNG and the other spin off series of the nineties. She introduces strong female characters. Mandala Flynn is an orphan without family or status in the Federation trying to prove herself aboard a Constitution Class Heavy Cruiser. She is outwardly confident and assertive, but with personal doubts about her abilities and reminiscent in some ways of the Ro Laren character from TNG. The other, Captain Hunter, is also a formidable personality. She commands a military and border patrol vessel that often must break protocol in order to protect the Federation and “get the job done”. She is tough and confident. Another ex-lover of Jim Kirk, she is portrayed as his equal and shares many of his personality traits as a starship Captain. It turns out that she is a member of a community family, a concept described as a group of people who enter a matrimony as a group. Within the group they have an open relationship and raise children together with some members staying home and others going off to work. The concept is described in appealing tones by both McCoy and Kirk within the group. The two officers see a strong family bond in this type of marriage, a family that both men have chosen to avoid in their lives. In the end, the novel does a pretty decent job of feeling like a Trek episode even though in the years since its publication, its basic plot devices have become cliché. My only caveat is that the character of Scotty seems to be totally out of place with how we’ve seen him before and since. He questions the motives of Spock and McCoy too easily, when the Scotty we know would have been much more loyal. It is, like all Trek novels, a quick read that you can finish in a day but scratches that itch to revisit some beloved characters. Next up, The Klingon Gambit. I loved this book starting out. The characters were spot-on, the friendship between Kirk and his past love Hunter was natural and warm, and the Security Officer Mandala was awesome. For that reason, it gets three stars. The plot was not great. There’s a lot of overly secretive secret-keeping, and Mordreaux is childishly protective of his “friends” that he sent to the past. The way he talks about it you think there must have been some conspiracy or something, but it turns out they just thought li I loved this book starting out. The characters were spot-on, the friendship between Kirk and his past love Hunter was natural and warm, and the Security Officer Mandala was awesome. For that reason, it gets three stars. The plot was not great. There’s a lot of overly secretive secret-keeping, and Mordreaux is childishly protective of his “friends” that he sent to the past. The way he talks about it you think there must have been some conspiracy or something, but it turns out they just thought living in the past would be cool and he’s apparently so starved for friendship he’d rather be lobotomized than disappoint them. Sulu has a romantic side-story that is pointless except to read some long-haired-mustached-Hikaru Sulu lovin’. The author included a distractingly large number of original characters, all with their own unique “thing.” I was reminded of how young writers and artists create a huge cast of edgy, cool rebels complete with special powers, scars, and troubled pasts. By mid-book I was cringing my way through every interaction with an original character, from the obnoxious wanna-be detective guy, to a dinosaur who only uses nouns and verbs, to a bloodthirsty cat-person aptly nicknamed Snarl, to a genetically engineered giant girl with low self-esteem who just wants to get the heck out of security and be a botanist. Kirk’s death hits the crew hard, as it should, but something about the way Spock and McCoy react missed the mark for me. It borders on unconvincing melodrama at times, which is a shame, because the author showed that they could write the characters well in the beginning. The story falls apart after Kirk dies. I thought it might get back on track at any moment, but it never did. Disappointing, but not the worst ST out there. I pulled Vonda N. McIntyre’s The Entropy Effect from my Star Trek shelf. I’ve read it several times but not recently. I’m sure when I first read when I was thirteen, I loved it. Kirk, Spock, Dr. McCoy—the whole gang is there so how could it disappoint? It’s certainly not as entertaining to read now but it’s not a bad book to have in your Star Trek collection. 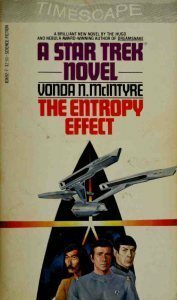 The Enterprise has been assigned to study a singularity that had mysteriously popped into existence and the whole crew is on edge, balance I pulled Vonda N. McIntyre’s The Entropy Effect from my Star Trek shelf. I’ve read it several times but not recently. I’m sure when I first read when I was thirteen, I loved it. Kirk, Spock, Dr. McCoy—the whole gang is there so how could it disappoint? It’s certainly not as entertaining to read now but it’s not a bad book to have in your Star Trek collection. The Enterprise has been assigned to study a singularity that had mysteriously popped into existence and the whole crew is on edge, balanced somewhere between boredom and worry. Just as Mr. Spock is finishing his observations, Captain Kirk receives an ultimate override command and is ordered to Aleph Prime, a mining colony. Once there, he has to take custody of once brilliant, but now dangerously insane, Dr. Georges Mordreaux. His presence on the ship creates havoc and disaster and only Spock (with Dr. McCoy’s help) can save the day. This is kind of your typical Star Trek book. It starts out very slowly and the plot takes well over 50 pages to really kick into high gear. There’s a bit too much touchy-feely-shippy stuff going on between two couples and I’m not all that interested in it. I also think it’s unrealistic that Spock would not include Scotty in the “need to know” details of all the time-traveling. Spock’s time-traveling device needed to tap into the warp engines to work and letting the head of engineering in on the top secret details would have made a whole lot more sense than making Dr. McCoy the little helper. I realize the author kept Scotty in the dark in order to add to the sense of chaos and impending disaster, but it wasn’t a decision Spock likely would have made. Vonda McIntyre tells an authentic and rousing Star Trek story with her oldie-but-goodie novel The Entropy Effect. This was the first non-movie Star Trek novel published by Pocket Books. It fit into the theorized second five-year mission that most of the early Pocket books did (similar to the ST animated series). Like many Star Trek outings Kirk, Spock, and McCoy are main characters. Mr. Sulu also gets a lot of story time. Mandala Flynn, a new ship's security chief, provides another lead character Vonda McIntyre tells an authentic and rousing Star Trek story with her oldie-but-goodie novel The Entropy Effect. This was the first non-movie Star Trek novel published by Pocket Books. It fit into the theorized second five-year mission that most of the early Pocket books did (similar to the ST animated series). Like many Star Trek outings Kirk, Spock, and McCoy are main characters. Mr. Sulu also gets a lot of story time. Mandala Flynn, a new ship's security chief, provides another lead character and a love interest for Sulu. It is she who asks him his first name, and he reveals it in this story for the first time--Hikaru. The Enterprise has been stationed for more than a month at a strange singularity in space. Spock has been conducting observations of the singularity which are almost complete when the ship is summoned to a Starbase on Aleph Prime. Kirk is tasked with transporting physicist Dr. Georges Mordreau to a rehabilitation colony. Mordreau has been convicted of murder by the federation court on Aleph Prime. The prosecutor Ian Braithewaite warns that the pioneer in quantum theory is highly dangerous. Classic Alternate Timeline story where Kirk is killed by a future version of a mad professor – who was also Spock’s mentor (ofc) – and Spock trying to rectify it for the good of the universe (no seriously if he doesn't the universe collapses in a hundred years. It's tried and true trek storytelling done to death since death. I liked it, although the two main antagonists - the Mad Scientist and the Overzealous attorney are very cartoonish. - Georges Mordeaux is such a late 70s earl Classic Alternate Timeline story where Kirk is killed by a future version of a mad professor – who was also Spock’s mentor (ofc) – and Spock trying to rectify it for the good of the universe (no seriously if he doesn't the universe collapses in a hundred years. - Georges Mordeaux is such a late 70s early 80s name for a villain either in trek or DC comics. - Captain Kirk turned down an extended polyamorous relationship *three times* and of course it was true love. - Sulu’s hair and mustache are long on a dare. - This is not an Uhura or Chekov book. - Hikaru has a crisis of where he should be and if he should start a relationship with the Security Chief. - It's partly played off as a bad dream, sort of a la Donnie Darko, and Spock is the only one with the whole story. This review has been hidden because it contains spoilers. To view it, click here. Well what can I say about this story. It is a time travel adventure and a murder mystery and what paranoia can do to people. First I will say that I really didn't like the prosecutor, Ian Braithewaite. He is a pushy, rude and paranoid idiot. Now some of the paranoia might be from the poison that he was given. It would be nice to see how he acts without the poison. Next you might want to keep some tissues handy there are some very sad and touching scenes to this story. Luckily they don't really h Well what can I say about this story. It is a time travel adventure and a murder mystery and what paranoia can do to people. First I will say that I really didn't like the prosecutor, Ian Braithewaite. He is a pushy, rude and paranoid idiot. Now some of the paranoia might be from the poison that he was given. It would be nice to see how he acts without the poison. Next you might want to keep some tissues handy there are some very sad and touching scenes to this story. Luckily they don't really happen because of the whole time travel thing. There are the usual cast of characters that populate a story of any type. I read this book many years ago when it was first released and all I could remember was that I liked it. I recently moved some books around in my home library and saw it. The book silently called out to me saying, "Hello Old Friend! Remember me? I bet you don't - only that you enjoyed reading me. Why not read me again?" Well, I did and I am very glad. If you are a fan of the original Star Trek and want to read a novel true to the original series that is well-written, thoughtful and helps further d I read this book many years ago when it was first released and all I could remember was that I liked it. I recently moved some books around in my home library and saw it. The book silently called out to me saying, "Hello Old Friend! Remember me? I bet you don't - only that you enjoyed reading me. Why not read me again?" If you are a fan of the original Star Trek and want to read a novel true to the original series that is well-written, thoughtful and helps further develop the characters you know and love (Kirk, Spock, McCoy, and mostly Sulu), then this book is for you. An ultimate security code interrupts a quantum observation experiment and diverts the 'Enterprise' to Aleph Prime. Their task is to transport Dr Georges Mordreaux to a prison rehabilitation facility. He stands accused of promising to send people back in time, but killing them instead. When Mordreaux appears to escape his cell on the 'Enterprise', killing Security Chief Flynn and Captain Kirk in the process, Spock undertakes a potentially devastating experiment to undo all of Mordreaux's work and An ultimate security code interrupts a quantum observation experiment and diverts the 'Enterprise' to Aleph Prime. Their task is to transport Dr Georges Mordreaux to a prison rehabilitation facility. He stands accused of promising to send people back in time, but killing them instead. When Mordreaux appears to escape his cell on the 'Enterprise', killing Security Chief Flynn and Captain Kirk in the process, Spock undertakes a potentially devastating experiment to undo all of Mordreaux's work and restore the galaxy to its correct timeline. Thankfully, The Entropy Effect was a strong start to Pocket Books' original novel line. It is a fun adventure featuring some fascinating twists and turns for our heroes, putting them in situations that hadn't been seen in Star Trek up to that point. There was a great deal riding on the shoulders of this novel, and Vonda McIntyre delivered a strong story that served to flesh out the world of Star Trek in new and interesting ways. A solid tale that led the way for 37 years of Pocket Books Star Tre Thankfully, The Entropy Effect was a strong start to Pocket Books' original novel line. It is a fun adventure featuring some fascinating twists and turns for our heroes, putting them in situations that hadn't been seen in Star Trek up to that point. There was a great deal riding on the shoulders of this novel, and Vonda McIntyre delivered a strong story that served to flesh out the world of Star Trek in new and interesting ways. A solid tale that led the way for 37 years of Pocket Books Star Trek novels! Here's hoping the current contract woes can be worked out and the line continues strong for years to come. Fingers crossed. Crítica publicada originalmente en mi blog. Durante días, el U.S.S. Enterprise se ha dedicado al estudio de una singularidad en el espacio-tiempo, un fenómeno de vacío que tiene perplejo incluso al vulcaniano oficial científico de la nave, el Sr. Spock. Por alguna extraña razón, la entropía en el entorno ha aumentado aceleradamente, y ello podía tener consecuencias desastrosas para el futuro del Universo. El estudio del fenómeno se ve interrumpido cuando reciben un mensaje de emergencia de máxima prioridad: deben dirigirse al planeta Aleph Prime para transportar a un criminal hasta la colonia de rehabilitación Rehab 7. Cuando llegan a Aleph Prime descubren que el criminal en cuestión es el Dr. Georges Mordreaux, y que está acusado de haber matado a varias personas y de realizar investigaciones poco éticas. El Dr. Mordreaux es un eminente físico teórico, antiguo profesor del Sr. Spock, y que ha estudiado la posibilidad de realizar viajes a través del tiempo. Spock no cree que el profesor pueda ser el culpable de nada, pero las investigaciones de Mordreaux traen consigo terribles consecuencias que solo el vulcaniano puede enmendar. Esta es la primera de una colección de novelas inspiradas en el universo Star Trek de la serie original y realizada por varios autores. Existen otras obras que son las versiones noveladas de capítulos o películas, pero esta colección que he comenzado está compuesta por historias originales. El efecto entropía la verdad es que me ha encantado. Me ha enganchado de principio a fin y he disfrutado como con los mejores episodios de la serie, con la diferencia de que un libro te acompaña más de lo que dura un episodio. Eso se nota, sobretodo porque permite al autor profundizar más en la historia de los personajes y en sus emociones. La autora realmente ha captado bien la personalidad que se describe en la serie de McCoy, Spock, el capitán Kirk o Scotty, aunque no creo que sea imprescindible haber visto la serie para pillar rápidamente el estilo de cada uno. Básicamente hay dos personajes en los que se centra la novela, o al menos les dedica más tiempo que a otros. Uno es Spock, que seguramente es de los más conocidos, y que por lo tanto uno ya puede prever sus reacciones y … ¿sentimientos? Yo diría que es el protagonista indiscutible, y me ha parecido fantástico que así sea, porque es seguramente el personaje más carismático de la serie. El otro personaje central es Sulu, y eso si ha sido curioso e interesante, puesto que la serie no permite conocer demasiado a fondo a los personajes secundarios. Eso precisamente a sido aprovechado como una ventaja, ya que de esta forma hay mucho margen para imaginar un pasado, o una personalidad más profunda de la que se conoce de la serie. A partir de ahora, me será difícil de imaginar a un Sulu de otra manera de como lo he leído en el libro. Además, resulta que hay una aportación particular al universo Star Trek que nace en esta novela. “Por culpa” de la autora, el nombre de pila de Sulu es Hikaru, que se ha mantenido como el “oficial”. La dosis de ciencia ficción a la novela la aporta sobretodo el hecho de que sean posibles los viajes en el tiempo. Es un tema muy utilizado, y también muy “peligroso” para el autor, porque éste tiene que lidiar de alguna manera con la paradojas que siempre aparecen. Se han visto muchas formas en la ficción de representar los viajes en el tiempo, que yo clasificaría en dos: en algunos casos hay una sola línea temporal, lo que significa que existe el destino, y que si algo tiene que pasar pasará. En esta clase de historias da igual lo que hagas en el pasado si viajas a él, todo está previsto. El otro tipo, yo diría que el más habitual, es el de las diferentes “líneas temporales”, en el que aparecen historias alternativas si se cambia el pasado. Es decir, que en estas historias puede cambiarse el futuro (o crear uno nuevo, según se mire). La que aparece en el libro es de esta última clase, y las paradojas que suelen aparecer en este tipo de viajes temporales son las de repetición de los personajes. Si viajas al pasado, puedes encontrarte con muchos “tus”: el del pasado, tu mismo, y cualquier otra versión futura de ti que volviera a ese punto o a uno anterior. Si viajas al pasado, ¿cómo regresas a tu presente y no a otro? ¿Tienes que vivir para siempre con tu yo del pasado, suponiendo que esa nueva versión de ti no viajará en el tiempo en su futuro como hiciste tú? En la novela es Spock quien viaja en el tiempo, pero cuando regresa al presente, en una línea temporal nueva, él es el único Spock que existe, lo que es paradójico puesto que ya habría un Spock en ese presente nuevo que no viajó al pasado. Resolver las paradojas no es posible, porque para eso son paradojas, y en las historias con viajes en el tiempo siempre aparecen algunas. Pero esta novela las ha reducido todas a ese pequeño detalle comentado antes, y por el resto de la novel la verdad es que está todo muy bien pensado y atado. En general es un libro que he disfrutado más que cualquier episodio, lo que me lleva a pensar que quizás algunos de los episodios que no tengo en gran estima de la serie original podían mejorar si se hiciera una buena novela con ellos. Tampoco espero que todas las novelas de la colección tengan la misma calidad. Por lo que he estado mirando, McIntyre es una reconocida y premiada escritora, que se encargó también de la novelización de algunas de las películas. Lástima que no haya ninguna más suyo en esta colección.